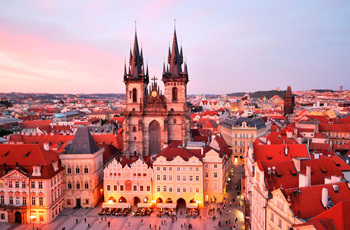 Prague's gothic spires, stone bridges, and cobbled alleys are calling! Lose yourself in the museums, churches, and charming squares of this vibrant town center. From the buskers on Charles Bridge to the bustling beer halls to the trams that zip along the cobbled streets, the city teems with life. Stay in a vacation rental apartment in the heart of the old town center. Sights to see: Charles Bridge, Prague Castle and St. Vitus Cathedral, the Mucha Museum, Old Town Square, the Jewish Quarter, and much more! Day trips: The fourteenth-century Karlstejn Castle, built to house the imperial crown jewels; the charming Bohemian towns of Cesky Krumlov and Kutna Hora; the nineteenth-century spa town of Karlovy Vary (Carlsbad) frequented by Beethoven and Marx; and the haunting “model ghetto” at Terezin, built to intern Jews before their transport to death camps. Sightseeing: The Castle with its imposing gothic St. Vitus Cathedral and Renaissance-era Royal Palace; the Lesser Town with the stone, fourteenth-century Charles Bridge, gardens, churches and antique shops; Old Town with its crowd-pleasing ancient astronomical clock; and the Jewish Quarter with its synagogues, museums, and multi-layered cemetery. Don’t miss a concert or opera in one of Prague’s historic venues. Off-the-beaten-track treasures that can’t be beat: Seeing a Dvorak concert at Villa America; visiting the same composer’s grave in peaceful Vysehrad Cemetery; wandering the magnificent gardens of the Troja Palace; taking a walk in the woods on Petrin Hill; enjoying a quiet row on the Vltava River; or sipping a foamy Pilsener in one of Prague’s ancient beer halls. One or two weeks in a personally selected, private apartment in Prague. Local information, plus our own Untouring Prague guidebook, researched and written by Untours staff, full of the best restaurants, sightseeing, and other suggestions. An Untours sponsored event, usually a church or chamber music concert.